Brushable slip resistant cementitious mortar with excellent adhesion and resistance to abrasion. Apply it to reduce and even eliminate slip in any surface, such as stairs, patios, walkways, sidewalks, ramps, tennis courts etc. Apply it easily using a wide emulsion brush and a paint roller. 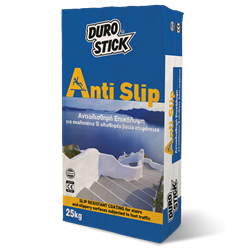 Suitable for applications on stairs lined with tiles or marble. Use masking tape to apply it in 2.5cm or 5cm strips and any other size, depending on the application surface. It application ensures stable and safe, slip resistant step surfaces, both indoors and out. If the aesthetic requirement (combined with tiles or marble) is beyond gray or white, use the white color ANTI-SLIP product, and color it using DUROCOLOR POWDER-C, pigments in powder form in 96 color chart colors. Classified CT-C70-F8-AR1 per EN 13813. For application in strip form: Indicatively 1kg ANTI-SLIP coats 40 linear meters of a 2.5cm wide strip, 20 linear meters of a 5cm wide strip and so on.